Millennium Precision is seeking team oriented people to help in our manufacturing operations. 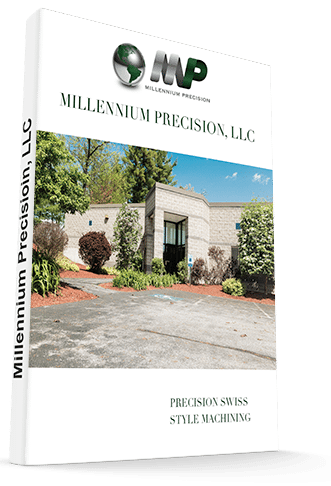 We are a growing, employee focused, contract manufacturer of Precision Swiss style machined components for multiple markets. We are a growing, employee focused contract manufacturer of Precision Swiss style machined components for multiple markets. Responsible for set-up (including programming if needed) and/or manufacturing (production) of part to the supplied customer print to achieve total print compliance. The development of optimal and efficient operation of equipment to achieve customer and company objectives. Experience with Citizen CNC Swiss Machines required and Mitsubishi controls. Knowledge of advanced set up, machine speeds and feeds for materials and tools. Ability to lead a team of operators who require technical assistance and to know what operators are doing at all times. Work closely with Manufacturing Engineer Tech to optimize tooling, reduce scrap, and improve efficiency. Experience with the selection and use of the measuring tools required to inspect product. Must be able to work independently, but demonstrate the ability to work productively in a team environment. To be responsible for good, quality parts from his/her team of operators. Quality, no exceptions, builds it right the first time and does not deviate from the process. Adhere to company policies and escalate nonconformance to your supervisor. Ensure team of operators are doing due diligence with in-process inspection reports. Ability to cross-train your team of operators to allow for flexibility. Familiar with ISO requirements and understand company’s quality management system and utilizing it. Ensure all tools, measuring devices, etc. used to verify customer parts compliance are calibrated and fit for service. Organization skills key to managing multiple tasks and being successful. Positive morale, which is very important to a team leader. Shows ownership. Take it and run with it. Enjoy it! Preferred: Two-year certificate in machine trades. This position is responsible for the daily set up and operation of their assigned machines. Experience with Citizen CNC Swiss Machines preferred and Mitsubishi controls. Understand how to read, write and edit G&M Codes. Able to read and interpret drawing requirements, including the interpretation and meaning of GD&T. Able to use simple math to perform basic calculations. Ability to work with basic hand tools (hand grinders, deburring tools). Ability to run drill presses, sanders and, at times, a pedestal grinder. Ability to lift up to 40-50lbs. at times. Ability to multitask between assignments. Deburring very small parts under a microscope is a plus. Ability to spin metal chips with Millennium’s chip spinner. Prepare bar stock for the Swiss machines on the shop floor. Someone who comes to work on time every day, who can be trusted to complete the jobs that are assigned daily with no issues. Clean, Safe, Enjoyable place to work! © [wpsos_year] Millennium Precision LLC.